Growing up in Wisconsin, I found nothing to celebrate about the Fall. The season to me only meant that the lush, warm, and all-too-short days of summer would come to an abrupt end, the dreary routine of school would begin, and as soon as the leaves turned from autumnal reds and golds to crackly dull brown, the harshness of months of ice and snow and bitter cold would begin. In the Fall of 1973, I was 11 years old -- the age my daughter is now -- and lived in a minuscule farm community of about 300 people. My family had moved there two years prior -- "A temporary move," claimed my father -- and we didn't get out until another 8 years had slowly passed. When you believe that you have no reason to invest in a place, no reason to make connections because you might be leaving "soon," you isolate yourself, and wait. The sole good thing about Fall, of course, was Halloween, and all the fun of dressing in costume and trying to get as much candy from the neighbors as you could. At 11, I was nearly out of the game. In this tiny town, trick-or-treating past age 12 was considered a total faux pas, and adults wouldn't hesitate to tell teens looking for a spare handful of mini chocolate bars to buzz off. Since we lived in a ranch house "in town" (as opposed to living on a farm "outside of town") the candy opportunities were excellent. You could stop by every single house there was if you wanted to, on foot, so you did, carrying a pillow case or garbage bag to hold the sweet loot. But before dark settled, there was another task at hand on Halloween: "Trick Or Treat For UNICEF." I can still hear the sing-songy cadence of it..."Trick or Treat for U-NI-CEFFFF..."
Trick-or-Treat for UNICEF is a fund-raising program for children sponsored by the United Nations Children's Fund (UNICEF). Started on Halloween 1950 as a local event in Philadelphia, Pennsylvania, United States, the program historically involves the distribution of small orange boxes by schools to trick-or-treaters, in which they can solicit small change donations from the houses they visit. Millions of children in the United States, Canada, Ireland, Mexico, and Hong Kong participate in Halloween-related fund-raising events for Trick-or-Treat for UNICEF, and the program has raised over US $188 million worldwide. Trick-or-Treat for UNICEF was invented by Mary Emma Allison, the wife of Presbyterian minister Clyde Allison. In 1949, the Allisons were living in Bridesburg, a neighborhood in Philadelphia, Pennsylvania, United States. 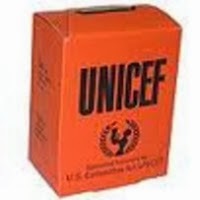 When Mrs.Allison saw a UNICEF booth collecting funds to send powdered milk to undernourished children around the world, she thought of getting children to collect donations for UNICEF instead of candy. Rev. Clyde Allison introduced the concept to local Presbyterian churches. On Halloween 1950, the Allisons recruited their own children and their community's to go door-to-door collecting nickels and dimes in decorated milk cartons to aid children in post-World War II Europe. They collected a total of $17 and donated all of it to UNICEF. In 1953, the United States Committee for UNICEF started actively promoting the program. By the 1960s, the concept had expanded throughout the United States, with small orange collection boxes distributed to millions of trick-or-treaters.When UNICEF won the Nobel Peace Prize in 1965, U.S. President Lyndon B. Johnson said in his congratulatory letter: "Your UNICEF Trick or Treat Day has helped turn a holiday too often marred by youthful vandalism into a program of basic training in world citizenship." In 1967, Johnson declared Halloween, October 31, to be 'UNICEF Day' in the United States; by 1969, 3.5 million American children were trick-or-treating for donations.Children (and adults) in the U.S. have collected more than US $170 million for Trick-or-Treat for UNICEF. 1970s Trick or Treat for UNICEF Commercial with Sanmy Davis, Jr.
Like regular trick-or-treating with candy, getting those coins in the little orange boxes was a highly-competitive event with the kids. We'd get the boxes at school, and the child who brought in the most money won some sort of prize while looking like a kind-hearted hero, helping all those poor kids in the Third World and such. Truth be told, plenty if not most of the families in my town in 1973 didn't have too much change to spare at all, including my own, but with the excitement of competition and the holiday, that was pretty well forgotten. I didn't hesitate to set out with my orange UNICEF box and a big, broad smile as soon as I got off the afternoon school bus, for I knew that all the kids would be doing the same. If you didn't get to a house first with your pitch and someone else did, you'd likely get turned away -- nicely at first ("Oh, I'm sorry, hon, I just gave to Gary there...you want a Tootsie Pop?") and then not-so-nicely ("Don't you kids coordinate this at school? I can't give out money to all of you!") with a definite closing of the front door. I wanted to win the prize and be the UNICEF hero, so I knew that I should go alone, and move fast. I wanted to feel that orange box grow heavy with nickels and dimes and maybe even quarters, and to go home and spread it all out on my bed, counting up the shiny tokens to glorious public recognition. It was a typical late fall day, already unpretty with the leaves dropped and dead, dull grey skies, and a cruel brisk wind. I borrowed some of my mother's warm driving gloves and took my Panasonic transistor radio along for company. It's like the radio knew I was bummed out about fall, because so many of the pop hits sang to me about sadness, loss, and loneliness: "Photograph," "Half-Breed," "Paper Roses," "Angie," "Midnight Train To Georgia." The WOKY DJs pattered away, regardless of the lyrical content. My first house was a neighbor that we had only just nodded and waved to, an elderly widow with permed white hair, round and stout and grandmotherly. I was a little nervous as I rang her doorbell as we rarely saw her, and her curtains were always closed. I could hear movement in the house. It seemed to take forever for her to come to the door. I could hear other kids running, shouting "TRICK OR TREAT FOR U-NI-CEFFF!" Come on, lady! Come on! She answered the door with a smile. She was using a walker, and propped the door open with a corner of it. "Trick or treat for U-NI-CEFFF!" I sing-songed brightly, giving a winning grin paired with the most sincere eyes I could muster. "Oh! Yes! It's that time again already! Yes, of course! Won't you come in a minute? I will see what I have in my purse." Awwww, no, I thought, I don't wanna go in! There's no time! She had already turned towards the interior, leaving me little choice but to enter, closing the door behind me. As I followed her into the kitchen, my nose wrinkled at the "old" smell throughout the house -- that combination of the musty dust from too many old things and too little fresh air. But I could see that she had already prepared a pumpkin-shaped plastic bowl filled with little bags of candy corn, and that everything was very neat and orderly, if a bit dark. Clomp-ca-clomp-ca-clomp, went the walker, and she began to ask me questions. Lots and lots and lots of questions, about school and my dog and my parents and the weather, in that way that is both terribly sweet and utterly excruciating for children. I was raised to be polite to my elders, and could not bring myself to utter the terse, brusque replies that would get me out the door faster and onto the next house. I couldn't do it, but felt like I had a thousand ants crawling on me, I wanted to bolt so badly. Before I knew it, she had me sitting at her kitchen table and put a plate of oatmeal cookies and a glass of milk in front of me. "It's so nice of you to stop by. I'm glad to meet the new neighbors!" Awwwww, man. I weakly smiled and nodded, nodded and smiled, and ate a cookie with one ungloved hand and drank some milk, my radio sitting silent on the Formica table, eyes darting around for a clock. She kept talking and talking and I just couldn't figure my way out. I didn't even know if she remembered why I came to the door, until the doorbell rang again. "Oh! Oh, yes! UNICEF! Halloween! Ha ha ha! Excuse me, please!" As she clomped to the front door, I shoved the last bit of cookie in my mouth, put my glove on, grabbed my radio and my orange box, and followed her, hoping I could exit with some kind of grace. To my horror, I saw it was almost dark outside. Almost out of time! UNICEF collections strictly stopped at nighttime. "TRICK OR TREAT FOR U-NI-CEFFFF!" Aw, dang! It was Carl, who was a year younger than me, and a head taller. He was my sworn enemy ever since he had teased me on the bus, I had turned around and scratched his face up like a wildcat, and he slugged me in the stomach hard enough to take my breath away. I thought I came out better because while I caught my breath in a few minutes, he had to go to school for a week with a messed-up face. Anyway, he was just as determined to win the UNICEF collection prize, and especially to beat me doing it. "Oh, yes! Lovely! You two wait here one moment!" the old lady told us. "I know my purse is here somewhere!" I heard my mom bang our screen door, going outside to give our dog Sam his dinner, cheap dry kibble with a gravy made from hot water and bacon drippings. Carl grinned evilly at me and shook his collection box, heavy with coins. "This is my third box, and you're gonna lose," he whispered at me. "Who cares? You probably stole it all, Stupid," I spat back. After another eternity, clomp-ca-clomp-ca-clomp, she returned with a small light blue plastic coin purse, embossed with the name of the only bank in town in gold lettering. "Here you go!" she exclaimed. Plonk plonk, two nickels into Carl's box. Plonk plonk, two nickels into mine. "ThankyougoodbyehappyHalloween!" Carl blurted, and ran off to the next house, wisely avoiding mine. Two nickels. I have two lousy nickels! Aw, man. "Marianne! Dinner's ready!" shouted my mom, seeing me there from our house, carrying Sam's now-empty bowl in her hands. Aw, nooooooo! I can't show up at school with TEN CENTS!!! But as the streetlights snapped on, Trick or Treat for UNICEF 1973 was over, and there was pot roast to eat, and real trick-or-treating to prepare for. I had to go home. "I enjoyed our visit, Marianne. Please come by again! Bring these to your family...you can leave the plate at the door later. I just put my candy bowl on the porch for the children tonight; I can't stay up so late these days!" Our elderly neighbor handed me the plate with the rest of the cookies on it, smiling, and I thanked her. I snapped the radio on, balanced the UNICEF box on top of the cookies, told Sam he was a good boy, and walked into my own warm, bright kitchen that smelled so wonderful. "How did you do? Did you get lots of donations?" asked my mom as she brought plates to our own Formica table. "No. I ended up getting stuck the whole time at Mrs. Johnson's house! She just wanted to talk! She sent these cookies for us, though." "Oh, how nice! I will bake a batch for her later and you can drop them off." I took the gloves off, sat down at the table, picked up my orange box, and rattled the two lonely coins inside. Rattle rattle rattle. My mom stopped for a moment. "That was the right thing to do. Thank you." I looked at her, all flushed from cooking, strands of hair loose around her face, and she was smiling at me. I smiled back, and rattled the box again, in time to "Space Race."